In the jar of a blender, combine the tofu, olive oil and water, blend stopping to scrape down the sides, continue until the mixture is creamy. Measure the semolina flour and salt in a medium mixing bowl. Transfer the tofu mixture into the flour, stir it to form a dough. The mixture will seem dry, use clean hands to press the dough into a ball and transfer it to a lightly floured surface using additional semolina flour to dust the surface of your cutting board. Knead the dough for about 10 minutes, sprinkle it with just a little water if needed. Continue kneading until the dough until it is smooth and firm. Cover it with plastic wrap and allow it to rest for 20 minutes. Bring a large pot of water to a boil. Prepare the sauce and toppings of your choice. Set up a pasta cutter on a countertop with ample work space. Divide the dough into six equal portions and flatten each piece into a rectangle. Roll the dough several times through the first setting (widest first) until you form a smooth long rectangle. Adjust the setting and roll the pasta again, continue rolling and adjusting the setting until the dough reaches the desired thickness (about the third to the last setting). 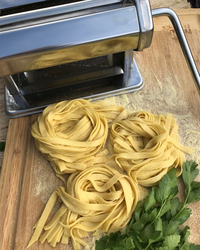 Cut the sheet of pasta using the fettuccine setting, lightly toss the noodles with extra semolina flour to keep them from sticking together. 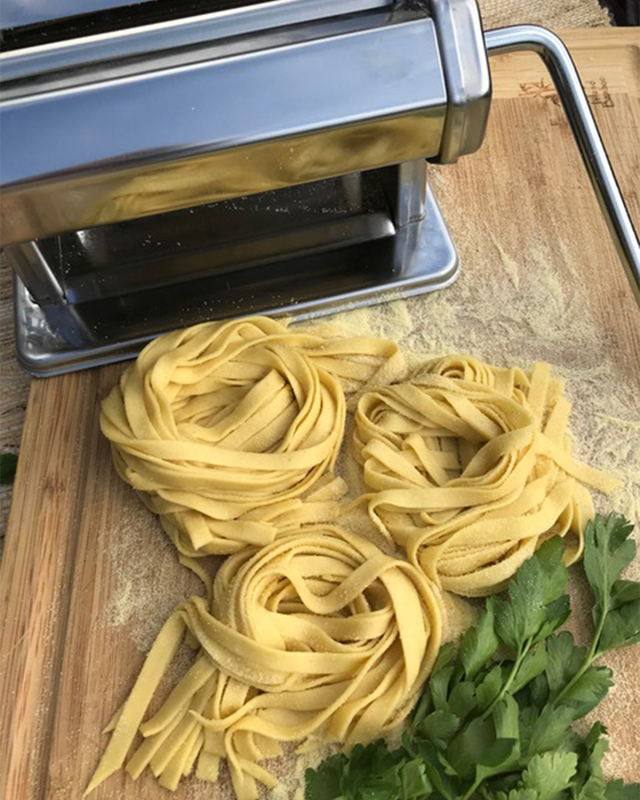 Cut the sheet of pasta using the fettuccine setting, lightly toss the noodles with extra semolina flour to keep them from sticking together. Drop the noodles in small batches into a pasta basket and place them in the boiling water. Cook for 3-5 minutes giving then a stir to keep them from sticking together. Lift the noodles out of the water to drain. Serve hot topped with the sauce of your choice. Chill and store uncooked pasta in ziplock bags. This recipe is also great for fresh ravioli and serves as a base for avocado, spinach, red pepper, chipotle, and other flavored pastas.